Cute story form the cartoonist behind PvP, about meeting a budding cartoonist. The kid's mom asked the Cartoonist to draw something for her son — he loves comics — but the kid's reaction was proof that he was going in the right direction. Via Fine Books & Collections Blog: "…in bad times two types of businesses always do well: Used bookstores and ice cream shops. If you can't afford dinner and a movie, a good novel and a chocolate sundae will do the trick." Sounds like the average summer for my family — we've never had a lot of money, so when the economy forces more people to live like us, well, we seem to win out! 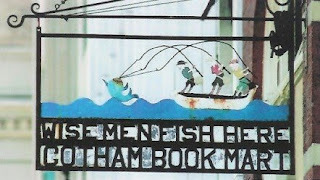 When the Gotham Book mart closed, its inventory of rare and antiquiarian books were bought by their landlord and stored in a Connecticut warehouse— oh, how there are days I wish I could accidentally run across such a place in my travels and buy everything that I could carry. Those books have sat, waiting for action, for almost four years now, but something surprising has happened: purchased by the landlord as partial payment for lost rents for a tenth of their value, the Gotham's former inventory has just been donated to the University of Pennsylvania's Rare Book and Manuscript Library. Lucky stiffs. Turns out, it's a sadder story than it sounds: the books were not burned in protest, nor for their content. Teachers in India found the outside temperatures falling to freezing levels, and decided they needed to do something...so they made a book bonfire to keep their students warm. 500 books indended for impoverished schools were tied into gunny sacks and set alight. Unfortunately, destroying those books wasn't a decision they were allowed to make: the police have issued citations to the instructors who approved the fire. While much of India is moving to the modern world, there is still much poverty — when your big decision is whether a book is more useful for education or avoiding exposure to the elements, you must live in an area that barely scratches at the edges of 21st century standards of living. The previous library kitty was Dewey Readmore Books, a ball of fluff that some jokester had dropped in the library's return slot. 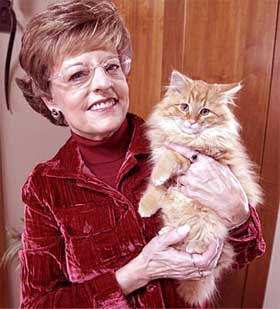 His rescuer penned a book, Dewey, The Small-Town Library Cat Who Touched the World, but she never had another cat after Dewey passed away in 2006 — that is, until now. While driving, she discovered a kitten in the road and rescued her; the new kitty's name: Page, of course.